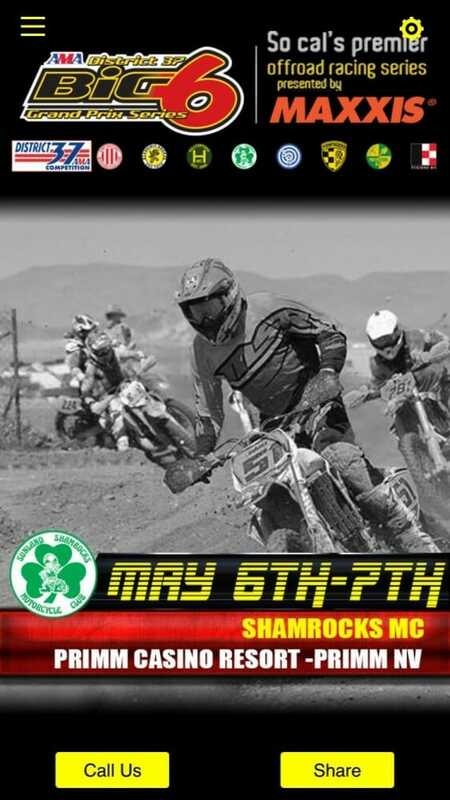 The AMA District 37/Maxxis Big 6 Grand Prix Series now has its own feature-rich app. Ladera Ranch, CA (April 17, 2017) – The AMA District 37/Maxxis Big 6 Grand Prix Series—the most popular off-road racing series in the western United States—is proud to announce it’s now become the first major off-road race series with its own feature-rich app. Available for both Android and Apple platforms, the Big 6 Racing app includes expected information like race calendar, Moto-Tally results, and links to social media as well as GPS directions to each venue. However, it goes far beyond that. Start the Big 6 Racing app to upload/share related photos, watch wrap-up event videos and get discounts from Big 6 sponsors (complete with map to their store, phone number, e-mail and link to their Web site). This is just the beginning as more features are in the works. Before long, you’ll be able to pre-enter races in order to save money as well as time since you won’t have to wait in those long post-entry lines that always seem to move slower the closer to race time you arrive. You can find it in the App Store; just search for Big 6 Racing or use one of the QR codes below. If you prefer, of course, you can still visit www.big6racing.com as well as the Facebook page www.facebook.com/AMABig6. Click here for all the latest off-road racing news on Cycle News.